You might need to exert some effort when you move or transition your child’s convertible car seat or even when you try to lift it up for cleaning. It would be a great struggle as most car seats on the market are quite heavy, approximately 20 pounds or so. It might be comfortable enough for your child but less convenient for you. Hence, a lightweight convertible car seat is what you need, or perhaps, the lightest convertible car seat. You might also prefer a lightweight car seat if you often travel with your family. Undoubtedly, you want to keep everything, including your luggage, as lightweight as possible. However, choosing the lightest car seat might be really tough. With this matter, we would be glad to assist you. We have compiled a list to help you choose the best lightweight car seat for your child. Graco Extend2Fit Convertible Car Seat 23.2 lbs. Rear-facing - 5 to 50 lbs. Forward-facing - 22 to 65 lbs. Evenflo Tribute LX Convertible Car Seat 9.1 lbs. Rear-facing - 5 to 30 lbs. Safety 1st Guide 65 Convertible Car Seat 14 lbs. Rear-facing - 5 to 40 lbs. Forward-facing - 20 to 65 lbs. Evenflo SureRide DLX Convertible Car Seat 14 lbs. Rear-facing - 5 to 40 lbs. 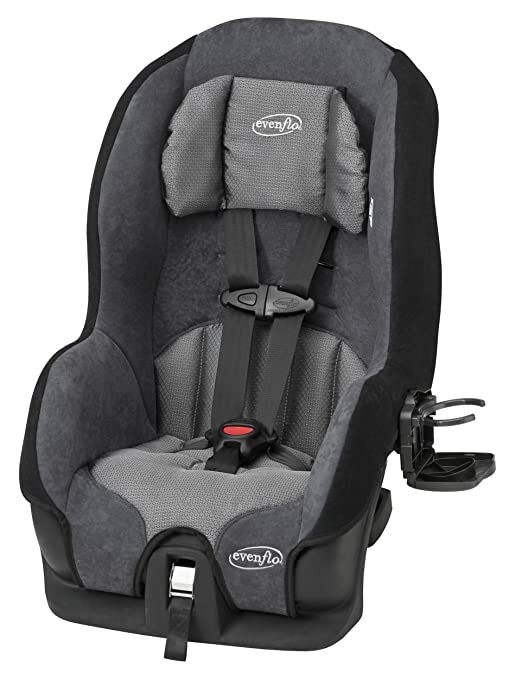 Evenflo Tribute Sport Convertible Car Seat 12 lbs. Rear-facing - 5 to 40 lbs. Graco is one of the most trusted brands in the market and so you can expect that their convertible car seats are reliable and durable. Their seats are also made to match the convenience for the parents. Just like the Graco Extend2Fit convertible car seat, it is designed to keep your child comfortable and safe at all times. Its lightweight feature, with the weight of only 23.2 pounds, will be of advantage on the parents’ end. Less hassle when you need to lift it up for cleaning, transporting or transitioning. In addition to this, its compact size allows you to leave more space in your car. The Graco Extend2Fit is a 2-in-1 car seat which is applicable for infants and toddlers. For rear-facing car seat, it is recommended for infants weighing 5 to 50 pounds while the forward-facing seat can accommodate toddlers from 22 to 65 pounds. It does not only provide a comfortable fit, but also superior protection with its Simply Safe Adjust harness system and one-second LATCH system. 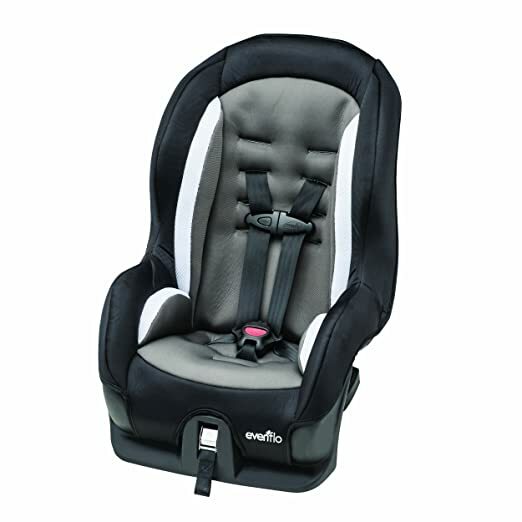 The Evenflo Tribute LX is probably the lightest convertible car seat on the market! It only weighs 9.1 pounds and definitely deserves why it ranks first in our list. With such weight, it might be an excellent choice for those who have smaller vehicles. It is also compact which makes it more convenient for those parents who usually take the seat to another car. No wonder it is the number one best-seller on the market. 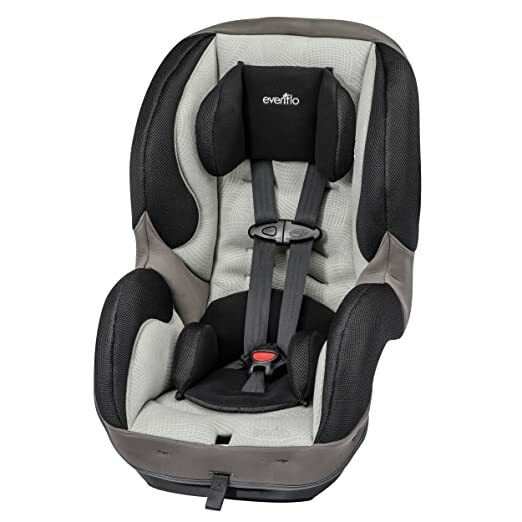 The Evenflo Tribute LX is a 2-in-1 car seat, rear-facing and forward-facing, which is recommended for infants from 5 to 30 pounds and toddlers from 22 to 40 pounds. For the safety features, the 5-point harness allows you to easily get your child in and out of the seat. If you also want to recline the seat, it is available for the rear-facing seat. And of course, as your child grows, you need to make more adjustments with the seat. The 4 harness positions and crotch buckle positions will let you do so. The easy-to-clean head pillow and pad are included. We also love how all the features are enough to keep the toddler safe and comfortable. It is side impact tested and meets all the applicable safety standards which guarantees ultimate protection for your child. We are also impressed about the price. It is very affordable and just right for those mom who are in tight budgeting. The Safety 1st Guide 65 convertible car seat keeps your child protected in both rear and forward-facing. The rear-facing seat, on the other hand, is recommended for infants from 5 to 40 pounds while the forward-facing is for toddlers from 22 to 65 pounds. Your little one will definitely find great comfort while you are at ease with regards to his safety and protection. With the weight of only 14 pounds, this is definitely considered as a lightweight car seat. It is compact and fits perfectly in your vehicle which leaves more room for the other seats. It also equipped with the LATCH system that keeps your child safe at all times. The installation is also hassle-free! However, just like any other products, it has drawbacks. The seat does not recline and there are times that the harness is difficult to tighten. The Safety 1st Guide 65 is approved for airline use. Hence, if you need a lightweight convertible car seat for air travel, this might be the one for you. Evenflo SureRide DLX is another lightweight convertible car seat that can be one of your options. It only weighs 14 pounds and is compact which can fit inside your car perfectly. 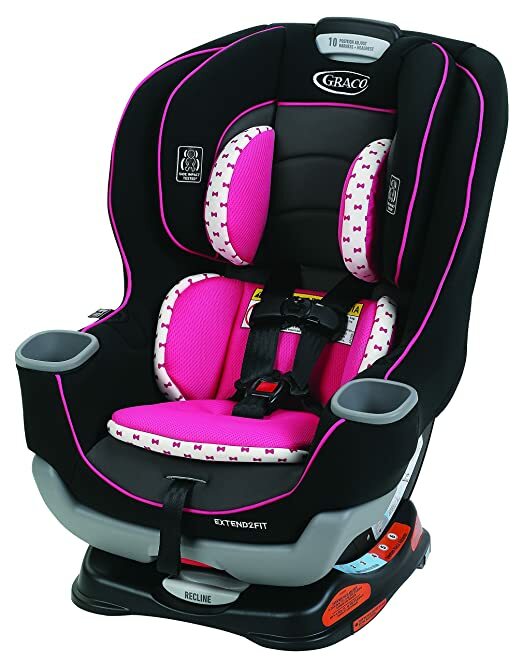 It is applicable for children from 5 to 40 (19-40 inches) pounds for rear facing and 22 to 65 pounds (28-54 inches). for forward-facing. The installation is also trouble-free and so the transition. And if ever you need to place to another vehicle, removing it won’t be a hassle either. There are available adjustments to customize the fit for your child. The 5-point upfront harness adjustment is a commendable feature that allows you to take your child in and out of the seat without any hassle. And to give your child a comfortable fit even after the years, the harness adjustments are available in 6 positions. The EvenfloSureRide DLX can be purchased in different shades to complement your car interiors and your child’s taste as well. The available shades are Bishop, Nicole, Paxton, Sugar Plum and Windsor. Evenflois indeed one of the best manufacturers that produce convertible car seats which are convenient for both parents and toddlers. Another member of the Evenflo family is the Tribute Sport which is also a lightweight baby car seat. With only the weight of 12 pounds, you sure won’t have to worry about transitioning or transporting the car seat. For your compact car, this might be one of the options you can consider. The Evenflo Tribute Sport is a 2-in-1 seat, forward-facing and rear-facing. The rear-facing has a recline feature which you can adjust according to your child’s comfort. This is recommended for infants from 5 to 40 pounds (19-40 inches) while the toddlers should be from 22 to 65 pounds (28-54 inches). It includes 4 harness positions with upfront adjustment and 2 crotch buckle positions to give your child the perfect fit even as they grow older. Aside from its light weight, we find it very affordable in its price. The installation, the cleaning and the adjustments not complicated thus easy to operate. 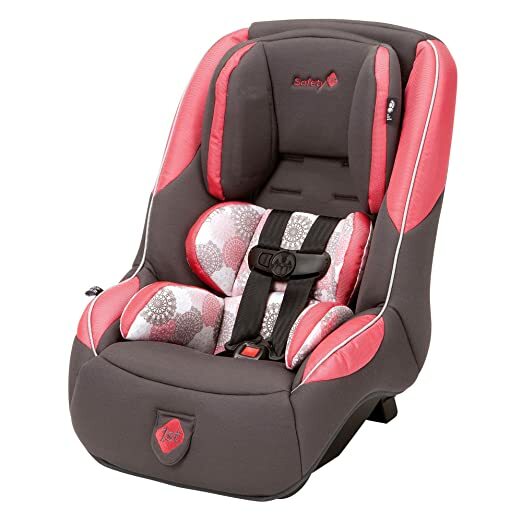 Most users also recommend this as a reliable lightweight convertible car seat for air travel. The convertible car seats mentioned in the list are some of the lightest car seats in the market. However, you must be wondering if a lightweight convertible car seat makes a difference. It does, actually. Checking the car seat’s weight is indeed a vital element if you are seeking for great convenience for yourself and your child as well. It would be a great advantage, particularly when you have multiple vehicles where you need to transfer your child’s convertible seat from one to another. It would cause you no trouble. With regards to travelling, it would not be a burden to your luggage.